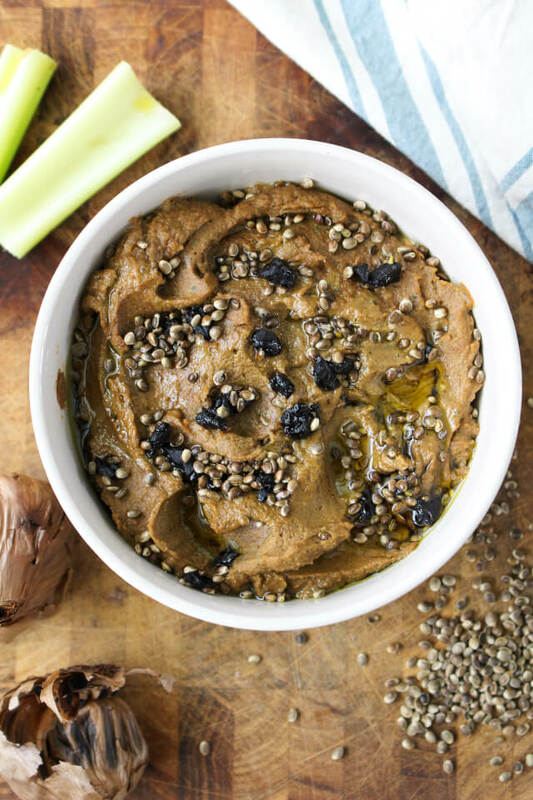 Hemp and Black Garlic Hummus is a super food packed snack that is great for dipping chips or veggies. Okay, I know what you're thinking. Hemp and black garlic? What the what? First, no, it's not marijuana, just in case that's what you were thinking. Hemp is pot's way cool not-gonna-get-you-high cousin that has loads of nutritional value! I'm talking more omega fatty acids than tuna, 33% protein, and nice and high in fiber. Think of a hemp seed like a flax seed: both are uber nutritious and delicious. Next, no, black garlic is not regular old garlic that is molded and gone bad. Black garlic is actually the garlic that you know and love that has been fermented for a month (stay with me here) until the cloves are black and sticky and super-charged with nutritional properties. Yep, black garlic actually has two times the antioxidant properties than raw garlic! As for the taste? It's like you've already caramelized it. All of that sharp, spicy, raw garlic flavor is gone and the result is a slightly sweet, kind of smoky, and super yum. I've swapped out the tahini for almond butter and the lemon juice for balsamic vinegar, but either one could be swapped with no problem. Naturally, some fresh herbs and spices had to be added as well. Finally, I finished it all off with a drizzle of hemp seed oil and some toasted hemp seeds. Now all I have to say is, don't knock it 'til you try it! 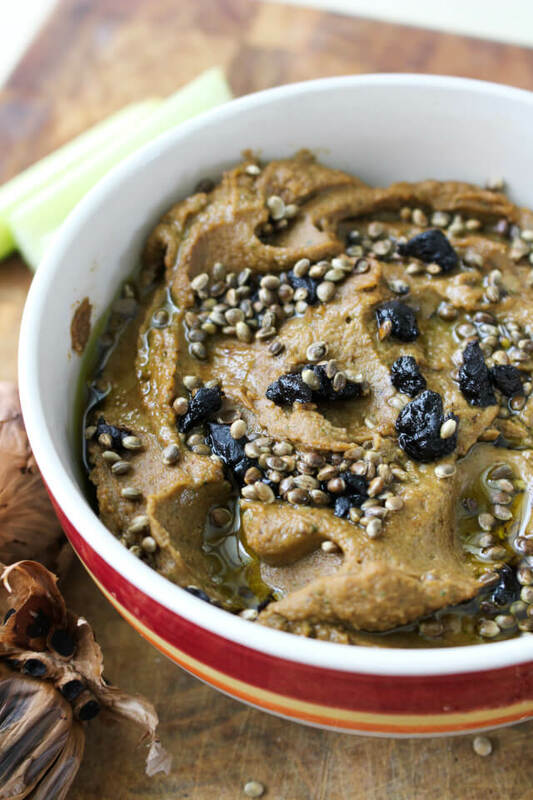 Combine the chickpeas, almond butter, balsamic vinegar, black garlic, hulled hemp seeds, parsley, cumin, salt, and pepper in your food processor. Pulse to begin combining the ingredients. With your food processor on, drizzle the hemp seed oil into the machine. Stop to scrape down the sides with a rubber spatula. Continue processing, adding water a little at a time until you reach your desired consistency if you would like it to be a little smoother. Top with additional hemp seed oil, toasted hemp seeds, and black garlic. You can use lemon juice for the balsamic vinegar, peanut butter or tahini for the almond butter, and any fresh herb you love in place of the parsley.